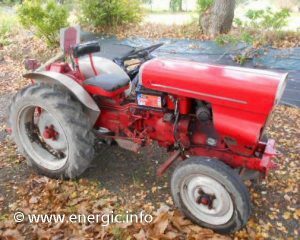 Moteur; Slanzi Diesel 1020cc DVA, bi cylinder, 4 stroke, vertical inline, 2 wheel drive. 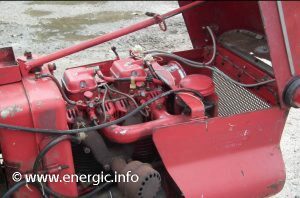 Lubrication by pump, Fuel filters. Max. regime 26 tr/mn. 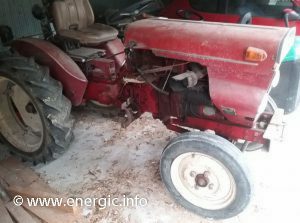 22 cv, SAE ou 20 cv DIN. 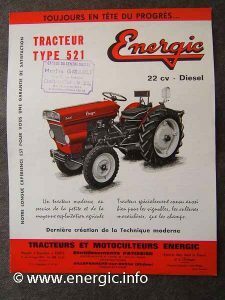 Energic tracteur 521 Slanzi 2 cylinder. Wheels; Front 400 x 15, rear 8 x 24 ou 9 x 24. Fuel tank capacity; 7.5 + ltr., with filter. Air filter; In bath of oil. 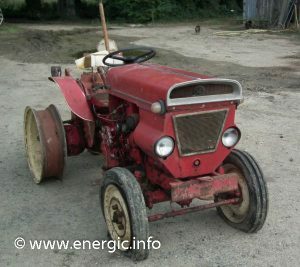 Gears; 12 speed gearbox forward, 3 speed reverse, 6 slow speed gears where available from a gearbox reducer. Differential blockable. + Reducer. PTO; Prises de forces available in all gears. 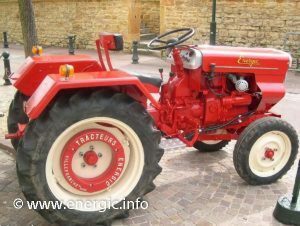 Brakes; Within the wheel, with hand brake operated on the rear wheels. Independent. 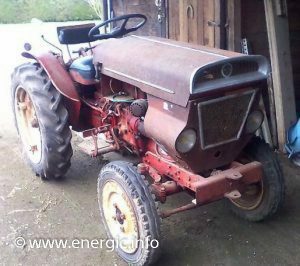 Electrics; With dynamo, starter, battery 12v 50amps., lights front and back, and plug for trailers sockets. Brake light indicator. 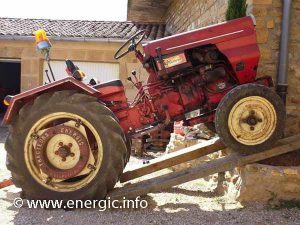 Hydraulic lift; Manuel adjusters for hydraulic. 3 point. Winch/Treuil; Available by special order. 200 m metal cable, adjustable for use in all directions. 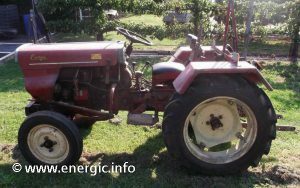 Additional equipment; Cutting bar (barre de coupe) – 1.37 m. Mounted in 2 positions between the wheels (traditional), or at the rear of the tractor. 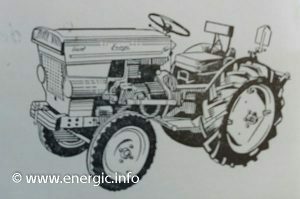 Sprayer, with reservoir 200 litrs, positioned at the rear of the tractor. 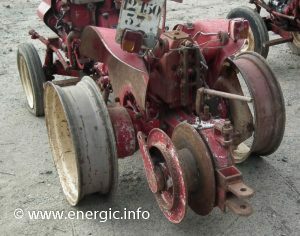 Operated from the PTO with 3 pistons with regular-able pressure 0 – 40 kg/cm. Using lances for spraying or arms set at the optimum height. 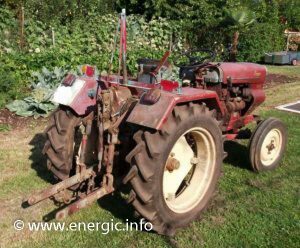 Energic tracteur 521 vigneron with winch/treuil. 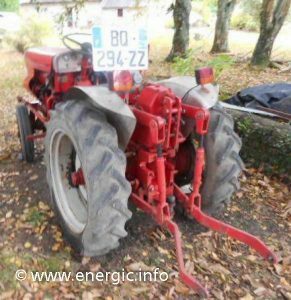 Energic tracteur 521 Slanzi 2 cylinder vigneron rear view. 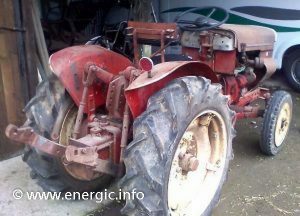 Energic tracteur 521 Slanzi 2 cylinder vigneron side view. 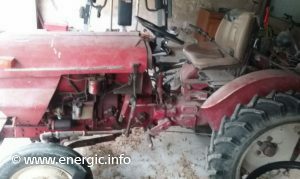 Energic tracteur 521 Slanzi 2 cylinder vigneron front view. 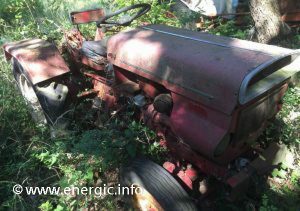 Energic tracteur 521 Slanzi 2 cylinder vigneron 1968 right side view. 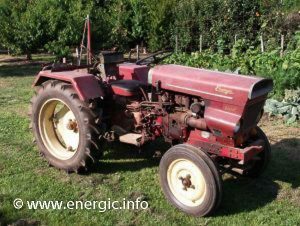 Energic tracteur 521 Slanzi 2 cylinder vigneron 1968 left side view. 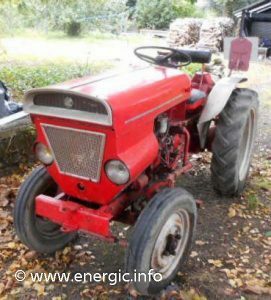 Energic tracteur 521 Slanzi 2 cylinder vigneron gleaming!